Bees attracted by the salt in human perspiration are collectively referred to as sweat bees. They are generally black with metallic red, green or yellow markings, and measure approximately ¼- to ½-inch in length. Many people encourage populations of sweat bees since they are efficient pollinators and highly beneficial agricultural insects. For others, the bees are pests. 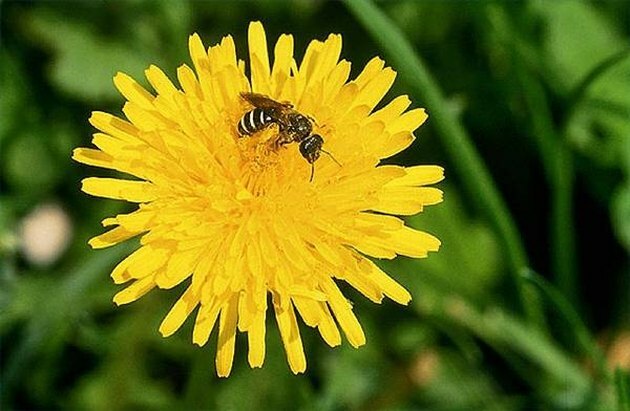 And for people with allergies, the bees are potentially dangerous, since they will sting if provoked. To remove an established population of sweat bees, follow the step below. Watch the bees throughout the day and make note of their nest entrances. Sweat bees tend to build their nests underground, in tree cavities, or among shrubbery roots. They are solitary insects, so each nest will not contain thousands of bees. However, they are gregarious and will construct their family nests within close proximity of each other, so there may be multiple entrances to identify. Mark the nest site or sites with small flags or sticks and wait for the sun to set. Don protective clothing: heavy pants tucked into long socks, long-sleeved shirt, gloves, hat and goggles. Approach the nests and sprinkle the area with liberal quantities of Sevin dust or diazinon. The emerging adults will carry the toxin back inside the nest with them, mixed in with that day's collection of nectar and pollen. Monitor the activity at the nests for seven days. If sweat bees are still active in the area, repeat the application of the insecticide. It may take three to five applications to kill the entire population. Alter the texture of the soil once the established population has been eradicated. Incorporate large amounts of compost or peat moss into the soil, and then conceal the area by planting ground covers such as ivy or goutweed. This will make the site unattractive to any future visitors. Remove any flowering plants that may be attracting the bees. Although they are known and named for their habit of lapping up human sweat, they gather pollen daily to take back to their young.